Our dentists offer professional teeth whitening services in our dental clinic in Laval. In most cases, the natural color of teeth varies from gray to yellow. The colour naturally fades with age. In addition, the use of certain products as well as the consumption of certain foods or drinks can affect their appearance by causing stains on their surface. Although teeth are not naturally completely white, many people want a more glowing smile. To meet this desire, we have at your disposal a wide range of professional products adapted to your needs. 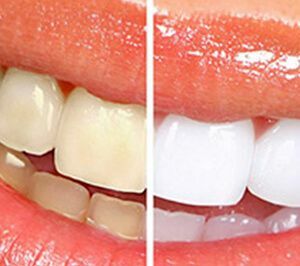 Teeth Whitening Can Quickly Restore a Bright Smile! The consumption of certain drinks such as coffee, tea, and red wine. Another lesser-known element that can have an influence on teeth whitening is the use of antibiotics during pregnancy. Some antibiotics, such as Tetracycline, act directly on the oral health of babies. In some cases, it can stain the child’s teeth. Other factors can affect the colour of teeth, such as decay, the nerve dying in one of your teeth, or an excess of fluoride at an early age. We are fully aware that the color of the teeth is important to many patients, as it may in some cases cause real discomfort. That is why our team of experts are happy to help you. Give back the pleasure of smiling without any complexity. You will also be able to receive judicious advice from our professionals to help you to find and maintain a brilliant smile. Contact Us Today to Make an Appointment at Clinique Dentaire de l’Avenir!